MT. PLEASANT, SC - Motley Rice LLC is proud to continue its support of the Mesothelioma Applied Research Foundation (Meso Foundation) and the Asbestos Disease Awareness Organization (ADAO), not-for-profits committed to helping those suffering from mesothelioma and other asbestos-related diseases by raising awareness throughout the public and private sectors in the United States and abroad. Each year, an estimated 3,000 people in the United States and Canada are diagnosed with mesothelioma. These victims are often service members, workers, veterans and family members who were exposed to asbestos in hazardous occupational environments or through household exposure. To date, there is still no known cure for mesothelioma and the average survival length following diagnosis is fewer than 12 months. "Motley Rice attorneys have stood at the forefront of asbestos litigation for decades, representing and advocating for the rights of more than 100,000 victims of asbestos exposure and mesothelioma. The fight, however, does not and should not end there. Supporting the Meso Foundation and ADAO's work is key to winning the battle against mesothelioma, finding a cure and stopping the use of asbestos," said Motley Rice member and mesothelioma lawyer Anne McGinness Kearse. Motley Rice supports the Meso Foundation as a "2012 Legal Partner for a Cure for Mesothelioma." The organization directs resources toward promising global research projects in an effort to find a cure for mesothelioma, as well as provides legal, financial and medical support to victims of mesothelioma and their families. The Meso Foundation expanded its initiative nationally and, in 2005, lobbied for the first national Mesothelioma Awareness Day, which has since spread as a successful advocacy movement across the country. As a result, the first official Mesothelioma Awareness Day took place on Sept. 26, 2011. Read an announcement issued by the Meso Foundation about its Legal Partners for a Cure Program. ADAO works to reduce the use of asbestos around the world. The organization's goals are to unite asbestos victims; educate the public and medical community about asbestos-related diseases; support research that leads to early detection, prevention and a cure; and ban the use of asbestos. 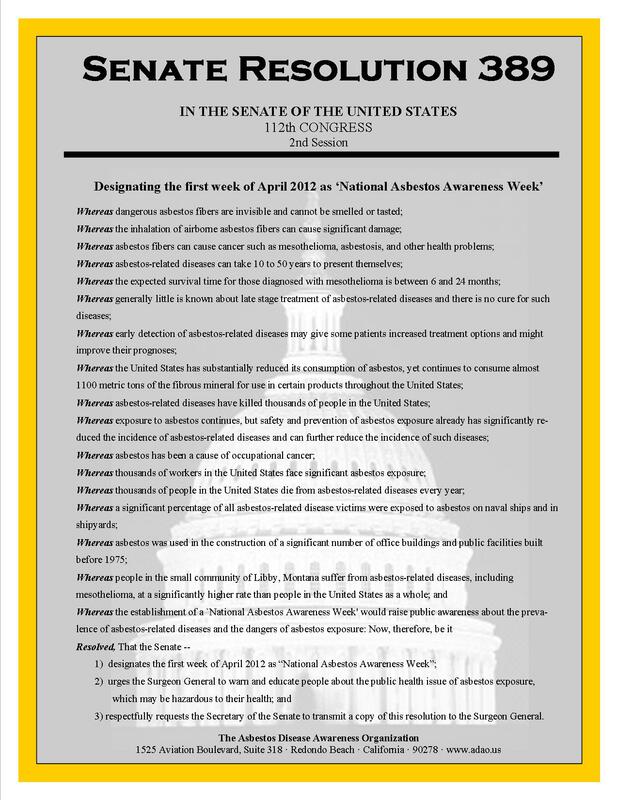 ADAO recently achieved an important goal in its mission to increase asbestos awareness, celebrating on March 7, 2012, the U.S. Senate's unanimous passing of Senate Resolution 389, legislation which officially designates April 1-7 as National Asbestos Awareness Week. Motley Rice's support of the organization helped it to gather the resources needed to push for this important resolution, and the firm will also be the official sponsor of April 5, one of the featured theme days that ADAO has organized for the already established annual Global Asbestos Awareness Week, also April 1-7. Motley Rice is one of the nation's largest plaintiffs' litigation firms. Motley Rice attorneys have a tradition of representing those whose rights have been violated and have a history of taking on complex civil litigation, including asbestos lawsuits, the historic tobacco litigation and the lawsuit against terrorist financiers on behalf of 9/11 families and survivors. The firm also litigates cases in numerous other areas, including prescription drugs such as Topamax® and Actos®; defective medical devices such as pelvic mesh and hip replacements; human rights, including sexual assault and international torture cases; aviation disasters; securities and consumer fraud; and wrongful death. Motley Rice is headquartered in Mt. Pleasant, S.C., and has additional offices in Los Angeles, California; Hartford, Connecticut; Washington, D.C.; New York, New York; Providence, Rhode Island; and Morgantown, West Virginia. For more information about Motley Rice, contact Joe Rice (DC, SC) at 1.800.768.4026. Connect with us on Facebook, LinkedIn and Twitter.